Delaware high school students got a chance to be real entrepreneurs for a day with the University of Delaware’s EntrePrep Summer Institute program, which was held on UD’s campus in July. Students teamed up to create and manufacture products, develop business plans and sell products on Main Street. They learned about marketing strategies and balancing a budget so they could make the most out of their one-day sales. Many of this year’s students decided to donate their profits to local charities, and all were able to get firsthand experience in running their own small business. These students included Jayda Garcia and Shawdae Ledgister, seniors at Delcastle Technical High School who decided to make a fashion statement with their business AmericanCap. The team sold distressed baseball hats in red, blue or black, and attached patriotic emblems to the front of the hats like stars and flags. Garcia and Ledgister said that they wanted to donate their profits to the Veterans of Foreign Wars (VFW) in Newark, which is what inspired them to make a patriotic product. At the end of the day, they donated $60 in profits to the VFW. Garcia added that she was hesitant to join the program at first, but realized how much she could gain from being a part of EntrePrep. Another business making an affordable fashion statement was student Aicha Pierce’s Couture Sunnies. Pierce, also a student at Delcastle Technical High School, sold trendy and colorful sunglasses at $10 each. During that time, she said she learned what went into making her business successful. Pierce started Couture Sunnies in April and felt as if EntrePrep would be a great platform to continue to grow her business. You can follow the Couture Sunnies brand on Instagram at @ShopCoutureSunnies. Neighboring Couture Sunnies was student Tatyana Daley’s Love Skin, a natural skincare brand. Daley is a rising sophomore at Howard High School and had thought about launching an organic skin care line for a while. Through the process of EntrePrep, Daley said she researched healthcare regulations, laws, permits and licensing, and learned about all the research that goes into launching a skincare company. She stressed the importance of managing her time and being as thorough as possible when packaging her product. Rising Howard High School sophomore Jeremyah Combs set up a raffle next to Love Skin, raffling off gift cards and products from Chick-fil-A and Wawa. Combs reached out to the marketing coordinators of Wawa and Chick-fil-A, and the companies donated gift cards and merchandise to be raffled off. Down the block from Daley and Combs was Devin Saienni and Alexa Archer’s business, Project Rad. Archer and Saienni were excited to use the opportunity of EntrePrep to showcase their musical talents by writing and recording their first CD, with Archer the lead singer and Saienni playing acoustic guitar. 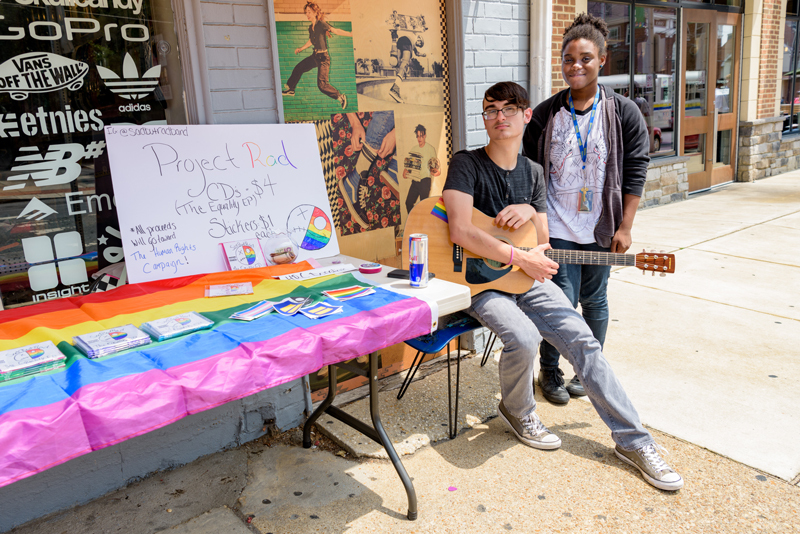 The team recorded a three-song EP focused on LGBTQ+ equality and sold the album for $4, as well as various stickers for $1. They donated their profits to the Human Rights Campaign, the largest LGBT civil rights advocacy group in the country. Another business Newark residents might have seen during Business for a Day was Kandy Kabob, created by Korryn Braxton-Young and Curryn Henry from Hodgson Vo-Tech High School and Amil Gibbs from Howard High School. The idea was inspired by Braxton-Young’s interest in the culinary arts. The team created “kabobs” including various candies with the idea of giving customers a variety of candy on the go. Tyler Rouwhorst from MOT Charter High School and George Grimes from Delcastle Technical High School took a different route than their peers by not setting up a table with a product to sell. Instead, the team decided to sell a service. “A lot of people from the program wanted to create a product, we took a different approach and wanted to provide a service,” said Rouwhorst. Rouwhorst and Grimes reached out to businesses to share with them the importance of advertising and marketing through social media, while offering to manage their accounts. Their net profit totaled $340. While the students ran their businesses, student mentor and program alumna Kimberly Kelly offered pointers and moral support. She said that she believes all of the students have the potential to achieve anything they set their minds on.